Hey everyone! 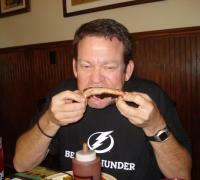 Katy here to tell you about my first experience at an awesome BBQ joint in Tampa. Last Friday, a group of us from the office (Steve, Brittany, Julia, Amy and I) had lunch at Kojak&apos;s House of Ribs and let me tell you...it was delicious! The ribs were highly recommended by our waitress (hence their name) but I played it safe and had the pulled pork sandwich with a side of baked beans. I was definitely happy with my decision (judging by the empty plate in front of me just seconds after it was set down). Steve, on the other hand, was the brave soul and ordered the ribs. Although messy, he said they were incredible and had enough ribs on his plate (and face) to last him until AFTER dessert...literally. For dessert, the five of us split the Mama&apos;s Chocolate Cake and Fresh Apple Cake, both with ice cream on top. WOW. We dug in like vultures and did not leave a single crumb on either plate! Kojak&apos;s House of Ribs has been family owned and operated since 1978. The setting is unlike anything else in town, inside a converted southern bungalow style home. Everything is homemade, which is obvious from the very first bite. The staff is very friendly and the service is excellent. I will definitely be returning to Kojak&apos;s House of Ribs and am very disappointed I had not been there sooner! Stay tuned in for more Tampa Dining Updates!